Beyonce was quiet. A push-an-empty-swing kind of quiet. That’s how most of the world saw her, until . . . . She can sing! Do you know she can sing? One teacher looked closer. Onstage, Beyonce became a different person. Dazzling! Confident Bold This was where she belonged. Beyonce is bold, talented, confident, and an inspiring voice and power to millions of people all around the world. This captivating picture book biography celebrates the icon's rise from a shy little girl to a world-famous superstar. Discover the story of Beyonce as she finds her voice, through trials and triumphs, and understand that you, too, can shine your light like Beyonce. 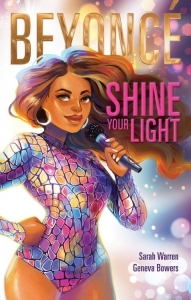 Powerful text and beautiful illustrations make this dazzling picture book biography the perfect read for everyone ready to get in touch with and shine their inner light like Beyonce.